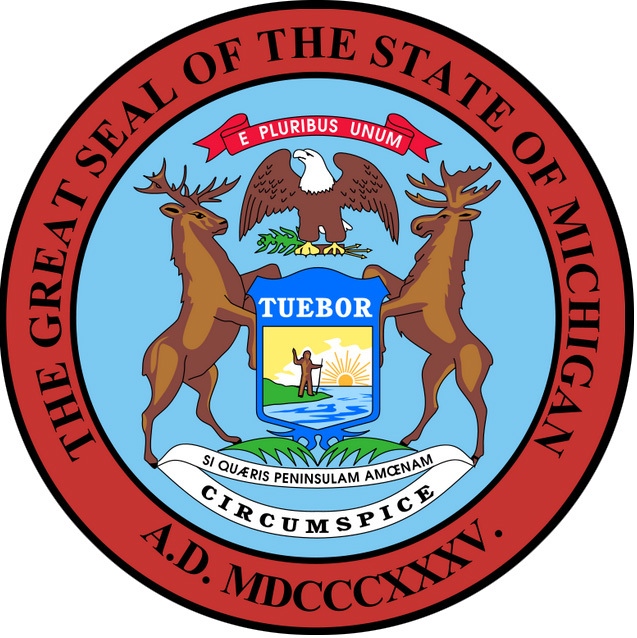 Great seal of Michigan; public domain image on Wikipedia. From Michigan.gov: "Michigan’s Coat of Arms was inspired by the 17th Century coat of arms of the Hudson’s Bay Company, one of the earliest and largest fur-trading companies in North America." The moose and elk represent Michigan (they are both natives of the state), the bald eagle is a symbol for the United States. "Si Quaeris Peninsulam Amoenam, Circumspice" is Michigan's state motto (meaning "If you seek a pleasant peninsula, look about you"). "E Pluribus Unum" means "From Many, One" or "One From Many" (our nation is made from many states). "Tuebor" means "I Will Defend" and refers to the frontier position of Michigan. Historic sketch of Michigan coat of arms; from page 352 of "The story of our nation ... " (1902). Text following image: "COAT-OF-ARMS OF MICHIGAN" Photo by Internet Archive Book Images/Flickr (public domain image).